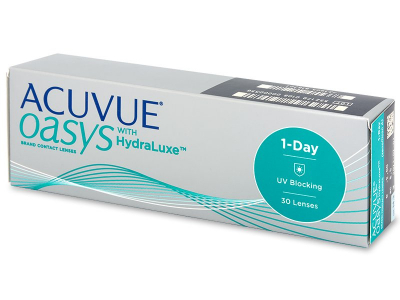 Acuvue Oasys 1-Day contact lenses from Johnson & Johnson contain moisturising ingredients and are enhanced with UV filters. This packages contains 30 lenses. Acuvue Oasys 1-Day from Johnson & Johnson are silicone-hydrogel lenses produced with the manufacturer’s pa­tented HydraLuxe technology to ensure your eyes stay fresh and comfortable all day. 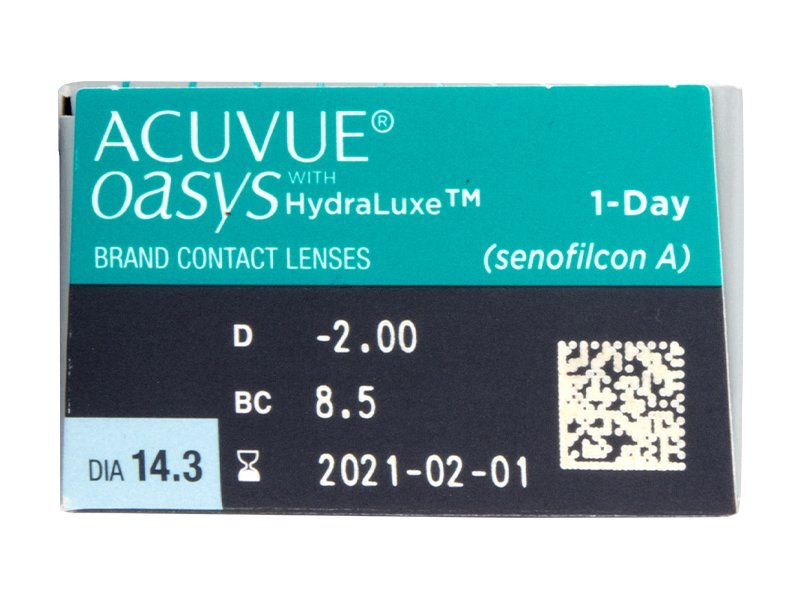 These lenses are an excellent choice for those with sensitive eyes or allergies. 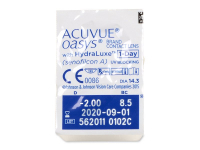 Acuvue Oasys 1-Day are also available in a box of 90 lenses. Lenses designed with HydraLuxe technology contain molecules that are biologically similar to human tears. Moisturising agents are embedded in the lens material, not only on its surface. This enables the lenses to help prevent the symptoms of dry eyes and other discomforts. These molecules enhance the eye’s natural tear film and ensure a healthy and comfortable fit. One-day contact lenses are considered the healthiest option for lens wearers. Using a new pair of lenses each day significantly decreases the risks of unpleasant infections. It also eliminates the need for lens-care solutions and lens cases. Acuvue Oasys 1-Day contact lenses are also equipped with UV filters that block 90% of UVA and almost 99% of UVB radiation. However, because the lenses only cover a portion of the eyeball, it is still recommended to wear sunglasses to better protect the entire eye area from sun damage. Perfect lenses for my dry eyes. Can wear these for the whole day. Been wearing these for around a year and they’re great daily lenses. I have no problem wearing these all day. I can get through my working day and not have to worry about these drying out or getting uncomfortable. Looking for Oasys L:8.50/14.50 Can you help with this prescription please. Hi I just wondered if you sell Acuvue oasys with Hydraluxe for Astigmatism . 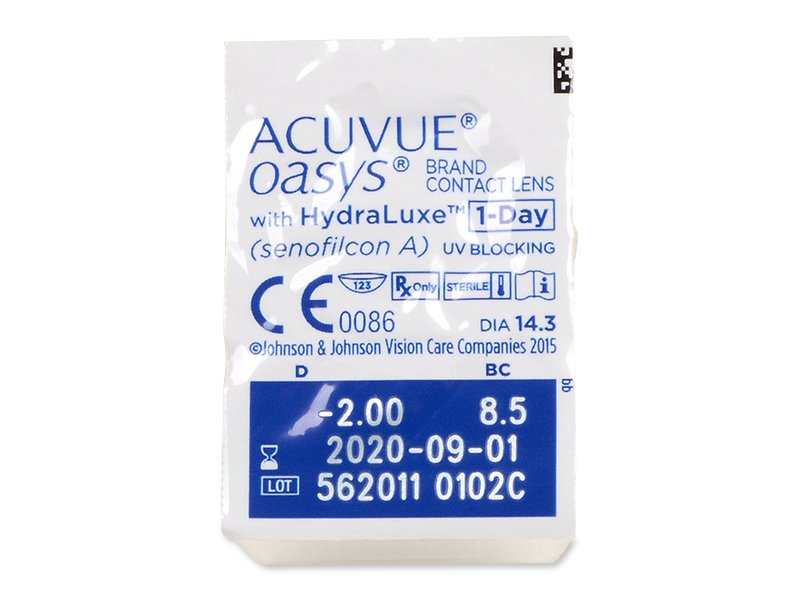 I can see this brand on your website but my box of contacts looks slightly different as it has a yellow astigmatism sign on the box above the blue 1 day circle . 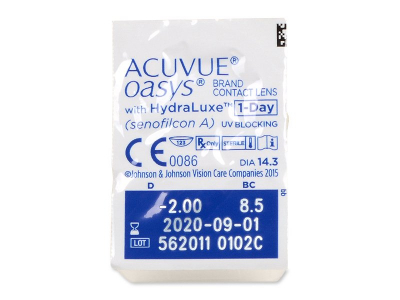 Hi, Samantha, Unfortunately, we don't yet sell Acuvue Oasys with HydraLuxe for our astigmatism line. However, we hope to have more optimistic news in the near future!